Air pollution is made up of gases or particles in the air which are harmful to humans and other life. The health impact is bigger the higher the concentration, and the greater the exposure. For some pollutants, there is no safe limit and exposure to even fairly low concentrations is harmful. The most concerning pollutants within Bristol are nitrogen dioxide (NO2) and particulate matter. Particulate matter is defined by the size of the microscopic particles, as this affects the impact it has on health. NOx is mainly emitted from road traffic, particularly diesel engines. When this is released into the air, it turns into NO2 through reactions with other pollutants and sunlight. NO2 is a poisonous gas and UK and EU standards exist to control concentrations. These limits are currently breached in Bristol. Different types of vehicles contribute to air pollution in different ways, as shown in the graph below. 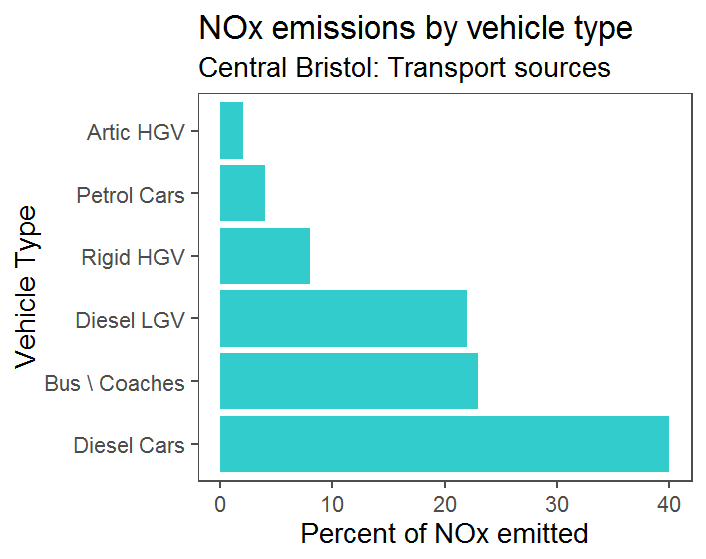 Diesel vehicles contribute 96% of the nitrogen oxides (NOx) pollution in Bristol. This is mainly caused by diesel cars (40%) followed by buses and coaches (23%) and diesel vans (22%). The Council and Government are investing large amounts of money to reduce the pollution which buses create. *Note that buses carry far more passengers than cars for their proportion of emissions; the chart does not reflect that. Vehicles sold in the UK need to comply with European regulations for air pollution. These are referred to as the EURO standards and have reduced the allowable pollution emitted from vehicle exhausts at each revision. The current standards for the newest cars are known as Euro 6 (cars sold from 2015 onwards). Many vehicles emit more pollution when driven in the real world than they do in the laboratory tests. 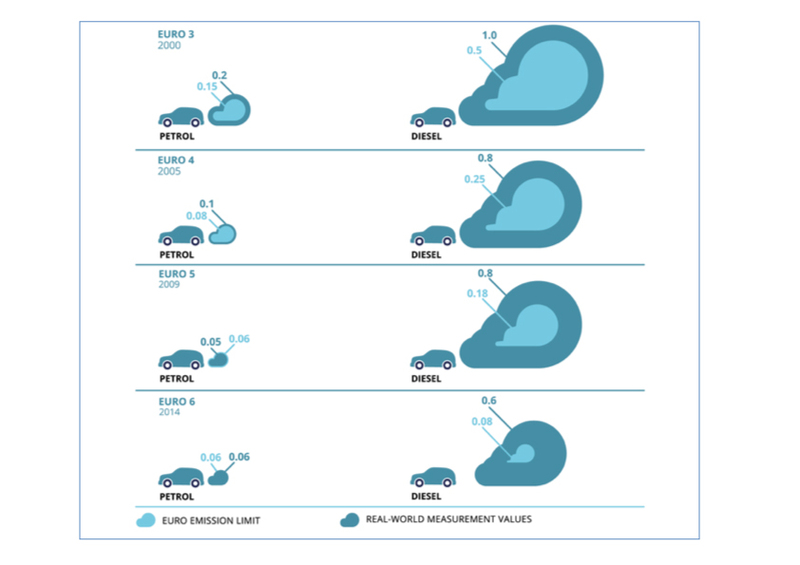 The diagram below shows the UK government’s data on emissions from different car types. It shows that diesels emit much more NOx than petrol cars, and that the gap between the test standard and average real world performance is much greater for diesels. Particulate matter comes from exhausts, vehicle braking and tyres. It is also emitted from the burning of both industrial solid fuels and household wood burners. NO2 is completely invisible. PM10 and PM2.5 are invisible too. This can be a factor in society’s failure to date to address the problem. Bristol City Council is concerned about both NO2 and PM. At the moment NO2 is the top priority for a number of reasons, not least the legal requirement for us to reduce it.